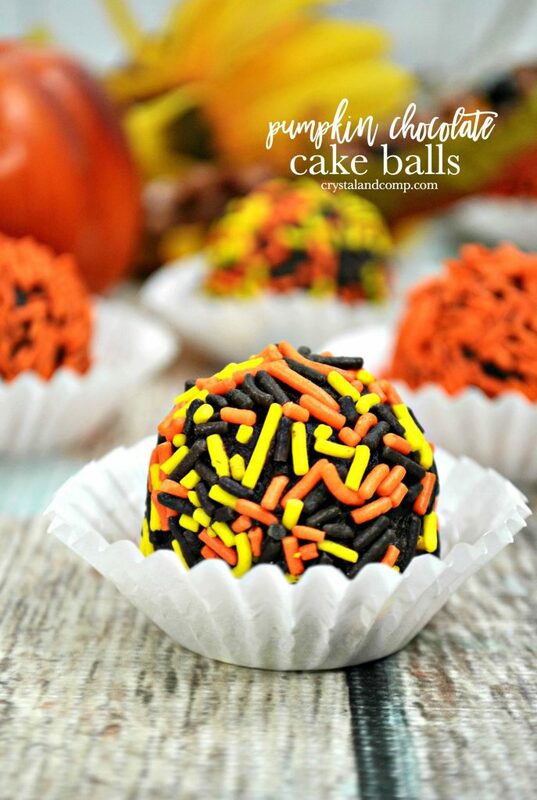 Do you have any cake ball recipes up your sleeve? What about pumpkin spice recipes? This dessert is so super easy to make and are perfect for birthday parties, baby and bridal showers, holiday gatherings, or just because. 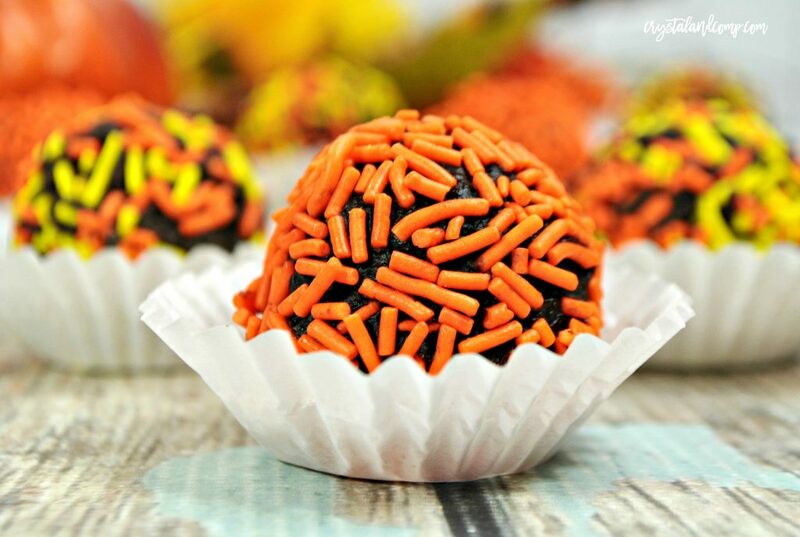 These pumpkin spice and chocolate cake balls are perfect for the Fall. You have to try them. I think you will love them and your guests will be impressed! First, gather up all of your ingredients. Grab your cookie sheet and line it with parchment paper. This will make clean up so much easier. Trust me! In a large bowl, dump in the chocolate chips and the butter. Set it aside. Grab a small sauce pan, over medium heat warm up the pumpkin creamer. Bring it to light boil. Pour the heated cream over the chocolate and butter. Let it stand for about 2 minutes, it will melt the chocolate and butter. Use a whisk to stir the chocolate, butter and cream until it is smooth. Get your 9×9 baking pan. Pour the melted and smooth chocolate mixture into the pan. Pop it in the fridge for about two hours, or until the chocolate is firm enough that you can shape it. Use a small ice cream scooper and scoop the chocolate into balls. Roll the balls in your hand to form a nicely formed ball. Roll the ball in sprinkles to coat evenly. Put the sprinkle covered balls onto the parchment paper that is on the cookie sheet. Continue until you use all of the chocolate mix to make balls. You can store the cake balls in an air tight container. Store them in the fridge in the container- you do want to refrigerate the balls for at least an hour before serving. Super easy, right? They are so good!!! 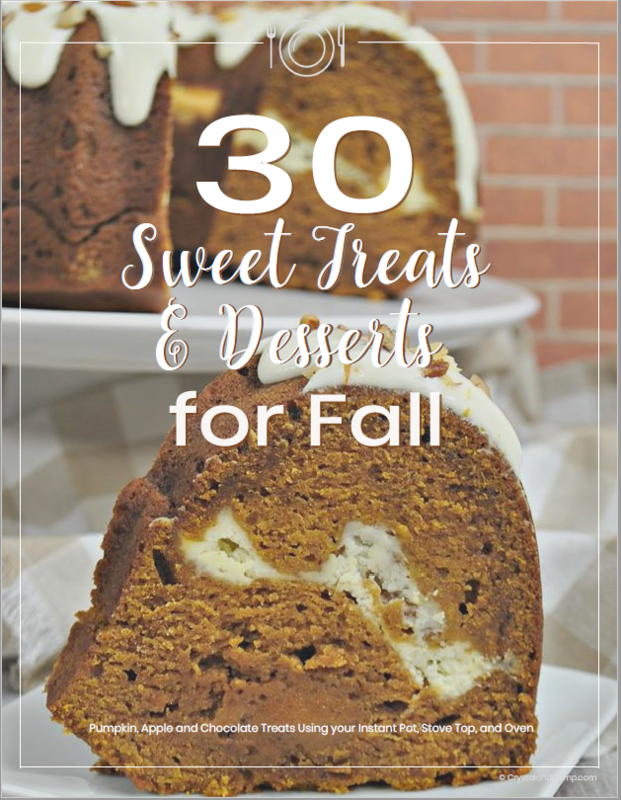 If you love fall desserts as much as I do, you will love these 30 Fall sweet treat recipes anyone can make! Get your 9x9 baking pan. Pour the melted and smooth chocolate mixture into the pan.